There are thousands of tools, utilities, and programs that come pre-installed on a Linux system. You can run them from a terminal window or virtual console as commands via a shell such as Bash. A command is typically the pathname (eg. /usr/bin/top) or basename (e.g top) of a program including arguments passed to it. However, there is a common misconception among Linux users that a command is the actual program or tool. Remembering Linux commands and their usage is not easy, especially for new Linux users. In this article, we will share 5 command-line tools for remembering Linux commands. Bash records all unique commands executed by users on the system in a history file. Each user’s bash history file is stored in their home directory (e.g. /home/tecmint/.bash_history for user tecmint). A user can only view his/her own history file content and root can view the bash history file for all users on a Linux system. To view your bash history, use the history command as shown. To fetch a command from bash history, press the Up arrow key continuously to search through a list of all unique commands that you run previously. If you have skipped the command your looking for or failed to get it, use the Down arrow key to perform a reverse search. Fish is a modern, powerful, user-friendly, feature-rich and interactive shell which is compatible to Bash or Zsh. It supports automatic suggestions of file names and commands in the current directory and history respectively, which helps you to easily remember commands. In the following screenshot, the command “uname -r” is in the bash history, to easily remember it, type the later “u” or “un” and fish will auto-suggest the complete command. If the command auto-suggested is the one you wish to run, use the Right arrow key to select it and run it. Fish is a fully-fledged shell program with a wealth of features for you to remember Linux commands in a straightforward manner. Apropos searches and displays the name and short description of a keyword, for instance a command name, as written in the man page of that command. If you do not know the exact name of a command, simply type a keyword (regular expression) to search for it. 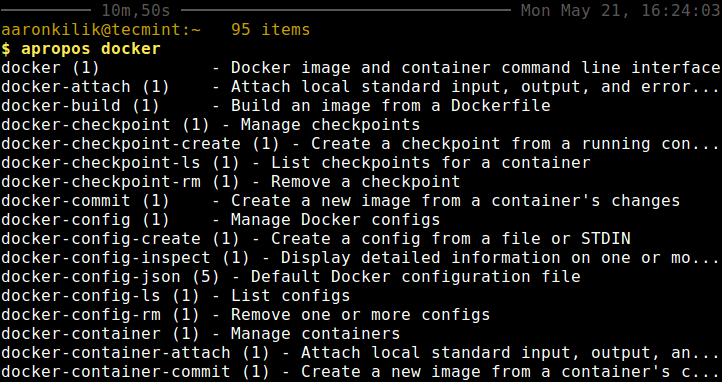 For example if you are searching for the description of docker-commit command, you can type docker, apropos will search and list all commands with the string docker, and their description as well. You can get the description of the exact keyword or command name you have provided as shown. This is another useful way of remembering Linux commands, to guide you on what command to use for a specific task or if you have forgotten what a command is used for. Read on, because the next tool is even more interesting. Explain Shell is a small Bash script that explains shell commands. It requires the curl program and a working internet connection. It displays a command description summary and in addition, if the command includes a flag, it also shows a description of that flag. To use it, first you need to add the following code at the bottom of you $HOME/.bashrc file. Save and close the file, then source it or open a fresh terminal windows. Assuming you have forgotten what the command “apropos -a” does, you can use explain command to help you remember it, as shown. This script can explain to you any shell command effectively, thus helping you remember Linux commands. Unlike the explain shell script, the next tool brings a distinct approach, it shows usage examples of a command. Cheat is a simple, interactive command-line cheat-sheet program which shows use cases of a Linux command with a number of options and their short understandable function. It is useful for Linux newbies and sysadmins. That’s all! In this article, we have shared 5 command-line tools for remembering Linux commands. If you know any other tools for the same purpose that are missing in the list above, let us know via the feedback form below. You forgot the Bash Tab tool. In Bash, type a few letters of the beginning of the command, press Tab, and you get all commands beginning with those letters. Add letters and press Tab again. Repeat until you only have one option, add flags and parameters and press Enter. Note: Some terminal emulators sound the alarm beep when you press Tab, just press again and it should work. You may want to try https://github.com/dvorka/hstr which reads Bash history and allows quick navigation and filtering – you can see the context of similar history entries. In addition to history management i.e. deleting particular command(s) from history, allows for “suggest box style” filtering and favorite commands lookup. It can be easily bound to Ctrl+r. Great, we will check it out. Many thanks for mentioning. Okay, thanks for the useful tip. Cheat is one of the best tools! Yes, cheat is awesome! We are glad that you found this useful. I love Linux (wait for it) but, I think if i had to decide between reading man pages or jumping off a bridge, i would have to think about it. I think that’s why i like reading some of your articles. when you read the articles then go back to the man pages they make more sense. I think that shows how useful examples are. Maybe i can make that a kind of project…. Thanks for this useful feedback, our main aim is to help Linux users(sysadmin, geeks, newbies) find easy ways of using this operating system we love. That is why we spend lots of time preparing articles such as this. Why even use the built in and easy to use features of bash when you can use less comfortable or third party ones, right? history? Ctrl+R surely will not perform a quick partial search in your history which you can cycle through by pressing Ctrl+R repeatedly. FISH? Pressing tab for the available commands must be hard. Man pages look scary when you won’t read them, but I don’t think that the easy solution is just not to read them and rely on third party instead. That explain script looks dodgy af. Man oh man, if only those tools came with a detailed explanation of what they do and how to use them. You can follow the provided links for detailed explanation on how to use them. @Erez is referring to the man commad, which if you know the name of the command, provides you with most of what you need to know. Many times the listing will mention related commands. Also useful for explainations for programming functions and other info in section 3 of the man system.